Sorry only home for 24 hours and no time to add words to pictures, so I will have to update you next week, as I haven't arranged a broadband connection at the house yet!! But I've just decided I need some sleep........!!! So....where was I....... it's been a busy couple of weeks! The first week the plumbers & electrician came back for a mad final finishing day! So we now have flushing loos and the decking lights give a subtle blue colourwash to the walls as night falls. Our two new Barcham container grown trees also arrived that day: one a Betula nigra, or river birch, which will have gorgeous orangey/cinnamon peeling bark and the other a Salix alba chermesina, or scarlet willow, which will have attractive red branches in the Winter. They both thrive in wet soil conditions so we've just got to decide now where they are going to live! The ramp is now complete and nicely matches the rest of the decking and balustrading and hopefully it won't be too long before it's all in the right shade of green! The brickwork to close the space beneath the decking will commence soon and should give a more finished appearance overall! The start of the second week saw the 'builder's clean' get underway and this was followed the next day by an amazing amount of mastic-ing inside and out!! The bed arrived on Wednesday, 2nd April and we spent all afternoon putting it together! So we decided to stay our first night in the house, a double celebration as it would have been my Dad's birthday too. 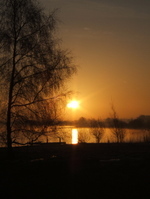 The amazing sunrise as I opened my eyes next morning was an unexpected treat, as was the sight of swans, Canada geese, Egyptian geese, a coot, a moorhen and a million rabbits wandering around the garden, not to mention the entertaining dawn chorus from a choir of unseen birds!! !